This morning I took Donna in to have a cataract removed from her right eye. The left eye had been done a few weeks ago and was very successful, with no complications. The surgery today also went well, but she has a bit more pain and swelling this time. We will see the doctor for followup tomorrow and then she is supposed to return to work on Wednesday. She needs our prayers. The weather is still keeping us cooped up inside. I have a few letterboxes that I want to plant, however I can not place them now without leaving a trail in the snow. The world will just have to wait for for the opportunity to locate my new offerings. But let me get on to today's primary subject. There is a quite little town in Pennsylvania that has become Hog Heaven, Groundhog heaven that is! For many years It has been the site of one of America's most unusual celebrations. In fact it's name is almost synonymous with the event. Of course I am talking about Punxsutawney the home of Phil the prognosticating woodchuck, or as this animal is known locally groundhog. In 1723, the Delaware Indians settled Punxsutawney, Pennsylvania as a campsite halfway between the Allegheny and the Susquehanna Rivers. According to the original creation beliefs of the Delaware Indians, their forebears began life as animals in "Mother Earth" and emerged centuries later to hunt and live as men. The name Punxsutawney comes from the Indian name for the location "ponksad-uteney" which means "the town of the sandflies." The name woodchuck comes from the Indian legend of "Wojak, the groundhog" considered by them to be their ancestral grandfather. When German settlers arrived in the 1700s, they brought a traditional feast held on February 2nd, known as Candlemas Day. Superstition held that if the sun came out that day, it meant six more weeks of wintry weather. 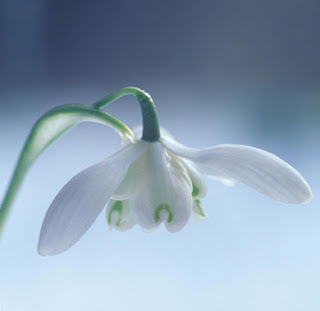 If the sun made an appearance on Candlemas Day, an animal would cast a shadow, thus predicting six more weeks of Winter. Germans watched a badger for the shadow. In Pennsylvania, the groundhog, was selected as the replacement. The earliest known American reference to Groundhog Day is a February 4, 1841 entry in Morgantown, Pennsylvania storekeeper James Morris' diary..."Last Tuesday, the 2nd, was Candlemas day, the day on which, according to the Germans, the Groundhog peeps out of his winter quarters and if he sees his shadow he pops back for another six weeks nap, but if the day be cloudy he remains out, as the weather is to be moderate." Pennsylvania's official celebration of Groundhog Day began on February 2nd, 1886 with a proclamation in The Punxsutawney Spirit by the newspaper's editor, Clymer Freas: "Today is groundhog day and up to the time of going to press the beast has not seen its shadow." The groundhog was given the name "Punxsutawney Phil, Seer of Seers, Sage of Sages, Prognosticator of Prognosticators, and Weather Prophet Extraordinary'' and his hometown thus called the "Weather Capital of the World.'' His debut performance: no shadow - early Spring. The legendary first trip to Gobbler's Knob was made the following year. The production of the "Groundhog day" movie helped to implant this otherwise obscure event in popular culture. While, early observances of Phil's predictions were conducted privately in the wooded areas that neighbor the town. Today's celebration sees tens of thousands of visitors from all over the world await Phil's annual appearance. Pictures of the event often include guys in the top hats and topcoats. These gentlemen are known as the Groundhog Club's Inner Circle. 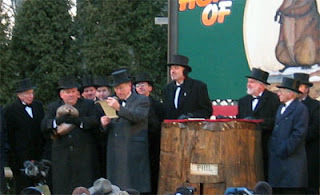 They're a group of local dignitaries responsible for carrying on the tradition of Groundhog Day every year. They are not only responsible for planning the events every year, but also for the feeding and care of Phil himself! Phil lives high on the hog (pun intended). He is housed, feed, and cared for throughout the year, along with his family and other groundhogs, In the Punxsutawney Memorial library which is part of the civic complex. The den, or "Groundhog Zoo", can be observed on the inside of the building from the children's library and also from outside of the building. Now I can't really WHIN any longer without discussing food. The dish that is most associated with Candlemas or Groundhog day is probably the crape. In France, Candlemas (La Chandeleur) is celebrated with crepes. People looking for ancient roots to the custom claim that the round crepe resembles the sun whose return is celebrated on the pagan festivals often celebrated at the same time of year. In fact, pancakes serve a very useful function at this time of year, especially when Lent begins soon after Candlemas, for crepes and other sorts of pancakes are a good way of using up eggs and butter and other rich foods that are given up in Lent. 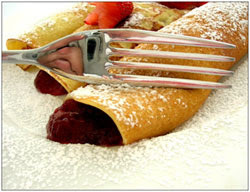 Shrove Tuesday (Mardi Gras) is another day when crepes are eaten--with various rich fillings. Crepes are a versatile food and may be eaten as a main course or as dessert. The favorite dessert crepes for Candlemas are filled with strawberries and whipped cream. The strawberry is known as the "Fruitful Virgin" and is regarded as sacred to Mary. Two good sites for receipes are Fisheaters and World wide Gourmet. The French have added to the custom of eating crepes on la Chandeleur a bit of ritual related to their making. When it is time to turn the crepe, the cook is supposed to hold a coin in one hand, make a wish, and flip the crepe in its pan with the other. Everyone is invited to attempt this operation and those who are successful may expect good luck in the coming year. If you are inexperienced with preparing crepes this may not work so well--but much fun will be had in the attempt. If you want something a bit off beat and different you may have fun singing this little ditty with your children to the tune of Rudolph. 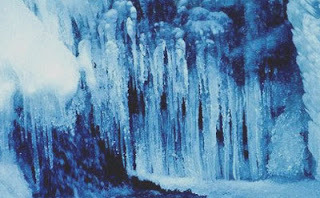 "Winter with your arctic blasts, won't you go away at last"
Six weeks or maybe more, till the winter's history. That is it for today, Closer to the big day I will make one last post about the Movie.